A Wee Musical Tour of the Von Trapps’ Austrian Home with Help of the Movie. I recently signed up for a blogathon where we were asked to gitter about our favourite homes in the movies or television. The cut off date of 1975 for TV related posts meant that this wouldn’t end up being another Dallas (1978-91) related post about the Ewings’ family home, Southfork Ranch. This post would have inevitably included a wee mention the Southfork Ranch drive where many of the Ewing clan got married (and usually to the same person). But I’ll stop now before I annoy y’all especially my mother. So on thinking about the movies, there are so many memorable movie homes. There’s the Overlook Hotel in The Shining (1980), a temporary home to the Torrances with its groovy patterned 1970s carpets and corridors, its ace for a 7-year-old boy to zoom about on his tricycle. There’s also the gorgeous twee, wee thatched cottage that Kate Winslet’s Iris lived in The Holiday (2006). In this contrived awful rom-com – although I confess to liking it once due to a crush on Jude Law’s voice in my hopeful romantic singleton days – terribly English Winslet swapped houses with Cameron Diaz in the Good Ol’ US of A. Cue much hilarity with their clash in cultures and inevitable romance for Cameron with a terribly British Jude Law, so stereotypically British he’s even called Graham. And for Kate, a kinda romance with American Jack Black where Black did zany fun annoying boyfriend, Winslet shockingly was fully clothed throughout and they didn’t snog. 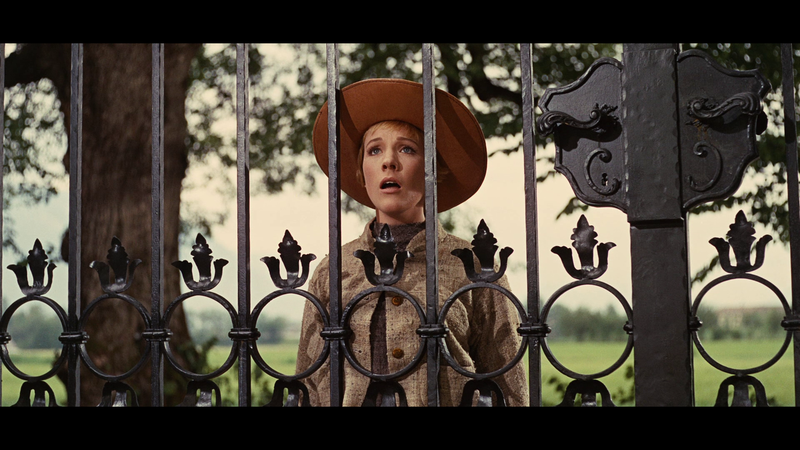 So after much deliberation, I plonked for the Von Trapps’ family home in The Sound of Music (1965). And like the song Do Ray Me, as featured in this movie, let’s start at the very beginning, a very good place to start… So it all kicks off after the scenic Austrian air shots almost like you are in the Chitty Chitty Bang Bang (1968) car. Maria (Julie Andrews), the novice nun sings The Hills are Alive, literally live on a hill yet “climbs every mountain”. Meanwhile at the convent, Maria’s personality is debated by a superfluity (according to t’internet) of nuns in How do you solve problem like Maria?. Maria is then sent to find herself by the Head nun who sends her to be a nanny to Captain Von Trapp (Christopher Plummer) and his 7 children. “And what’s so fearsome about that?” (sorry – this movie does have memorable lyrics). She bursts into song (did I mention this is a musical?) the lead up to – with those aforementioned lyrics to the house as Julie sings her wee heart out to I’ve Got Confidence, which to be fair she does. Until she sees the Von Trapps’ house. This being her first view of Chez Von Trapp or to be more accurate as it is set in Austria, Das Haus von von Trapp (translated and spelling via Darlin’ Husband). Either way you can see why she balks – in fact I’m impressed she found the doorbell. 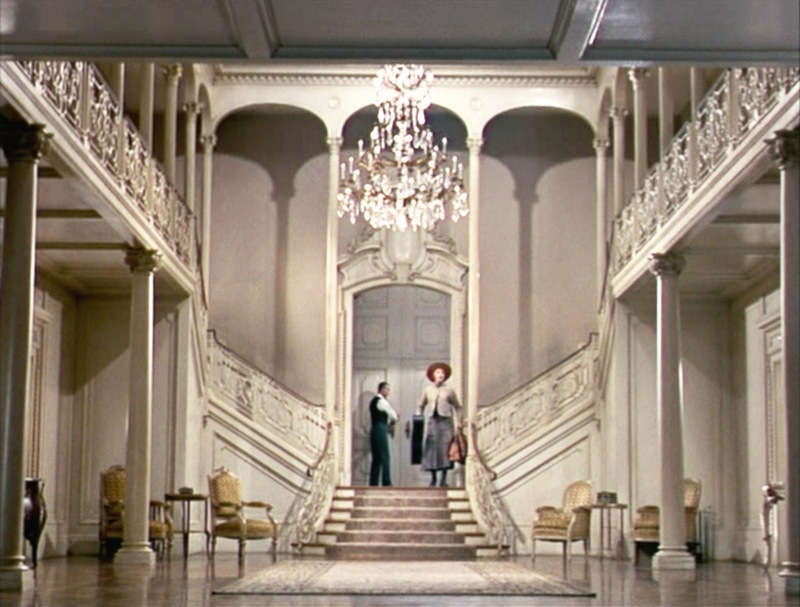 So once she enters – after mistaking the butler for Captain von Trapp – this is her view – an austere, cold, unwelcoming and empty entrance hall flanked by two staircases and a balcony. Maria is the curious type and this is one of her attributes surprisingly not mentioned by the nuns in their wee musical number. 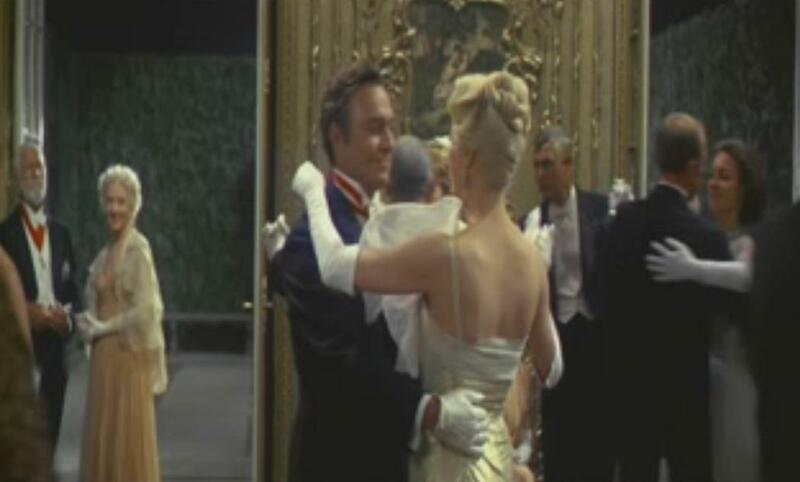 And so she investigates the rooms more and is caught by Captain Von von Trapp – the man of the house – in the ballroom, which appears a dark and unused room. 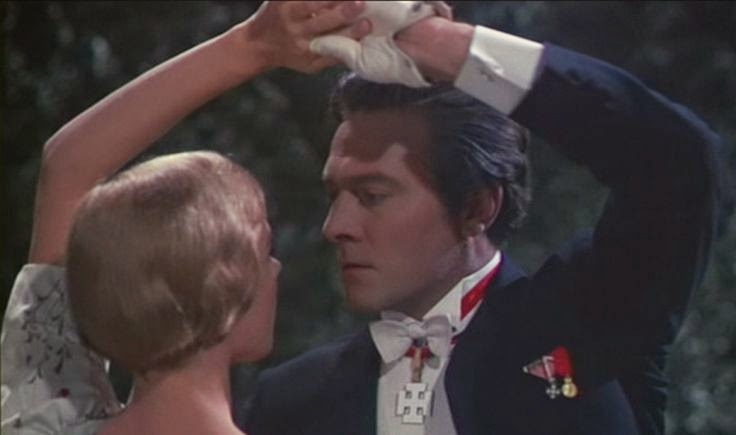 Von Trapp is a dashingly, handsome Christopher Plummer. But I digress. 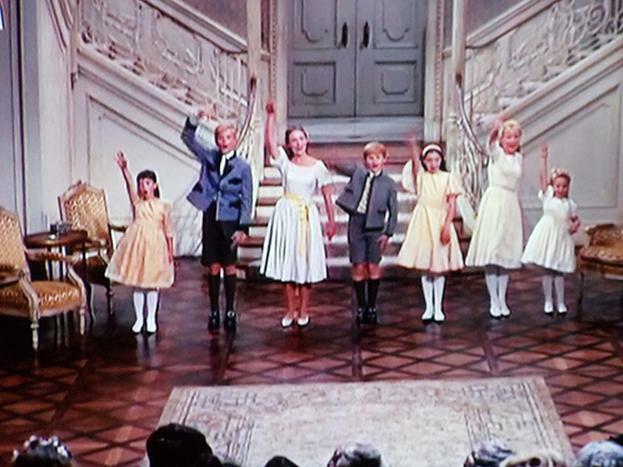 On returning to the entrance hall, with 7 unique whistle calls we meet the 7 kids – So there’s Liesl, Frederich, Kurt, Louisa, Brigitta, Marta and Gretl – who appear marching down the stairs and then saluting their father. As the Von Trapp kids do. In matching sailor outfits. Which fits in as he’s a Naval Captain of a Landlocked Country. So the kindly Housekeeper takes Maria to her en suite bedroom and the Housekeeper confides that the children haven’t had music in their lives since the mother died. Maria’s bedroom in comparison to the other room is quite cosy, with a lovely four poster bed but ghastly curtains. All of these figure later in the storyline.. so read on for more on these. With a wee prank along the way played by the kids..who don’t want a governess. As kids don’t. It’s then tea time, where the von Trapp kids prank their governess. After they show a tearful remorse. 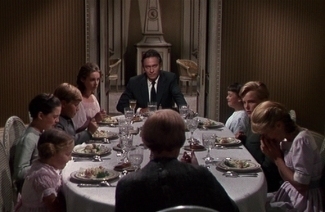 As the family dine as a family with the nanny and we meet dashing Captain von Trapp again. The dashing one says he’s off on a trip the next day and will bring back Uncle Max and Von Trapp’s Baroness girlfriend. Eldest daughter Liesl escapes from this scene as quickly as you can say the word telegram. Then we meet Rolfe, a telegram boy (and one of Hitler youth) at the gazebo outside as eldest daughter, Liesl runs to him in the darkness. 16 going on 17-year-old Liesl is in love with this 17 going on 18 lad. And they sing a soppy wee duet, 16 going on 17. And the pair dance together in the gazebo as a storm breaks. As the rain pours down, Maria is settling down for the evening preparing for bed, the nun to be prays. Liesl enters and is motioned to wait to talk with her new governess. She’s worried but the nun to be is a forgiving sort and sends her to change in the en-suite bathroom (no picture as this is a kids film). Cue frightened children as the storm breaks, as Maria sings about her Favourite Things. Cue bonding with kids. 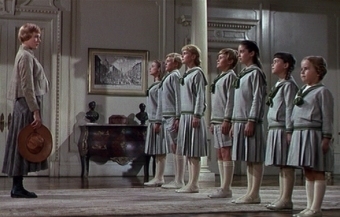 Captain von Trapp appears and the kids disperse. And Maria finds a use of the soon to be binned ghastly curtains. Cue lots of bonding with Maria and kids with a guitar. On hills, in town and in the market. Kids donning the ex curtains, which to them is a nice change from their sailor outfits. And the kids are taught how to sing in Do, Ray, Me with actions. And Captain von Trapp returns home with the Baroness and Uncle Max in tow. We are then treated to seeing the Von Trapp family patio, and it’s view next to the lake. Which is the scene for an argument between Maria and him on his children, he thinks he knows them, she thinks she does and he doesn’t. On re-entering the house, we go to the drawing room as the children sing Edelweiss to the Baroness in now more child appropriate, non curtain/naval inspired attire. Captain Von Trapp from the hallway gets emotional. He apologises to Maria, almost seeing his children as his children, for the first time. He joins them in song. I well up. He sings solo, I’m in tears. And he hugs them. The first apparent loving emotion shown by this man to his children. I sob. Leading to one of those moments between him and Maria, as their feelings grow and change. i sob more. Maria puts on a wonderful puppet show with the kids, all singing a part in The Lonely Goat-herd for the Baroness. The Baroness suggests a ball inspired by this influence of Maria on the family and particularly the Captain. We then return to the ball. The ballroom and entrance hall which are now bright, colourful and full of music and dancers for Captain Von Trapp’s ball. Meanwhile observing the ball in the dark (also reflecting the lack of colour in their lives), the kids tell Maria about the Baroness’ engagement to the Captain. One of the boys, Kurt dances with her, with more colour added to the scene. The Captain and Maria dance together in front of the children (I’m still in tears) and their romantic chemistry is apparent to all. Including the Baroness. The kids go to bed make full use of the staircases in the entrance hall with So, Long, Farewell enchanting Von Trapps friends. However Captain Von Trapp’s burgeoning feeling Maria has been noticed. Maria is also apparently as besotted as he is. The Baroness comments on his love to Maria, in a girly chat with her in Maria’s bedroom. Maria slips away, returning to the convent… as she leaves the house that dark night…. and the house is seen again, but join the film to find out more. It is interesting just how Von Trapps house and its rooms change physically, socially and emotionally in the course of this movie. At the start Von Trapps house is dark, cold, austere and unwelcoming as the children and Von Trapp seem at the beginning. Once Maria enters their life the rooms become warmer, brighter, colourful and friendly. The children change too through their love of music, and after a while their clothes change representing freedom from their rigid roles by Maria. The more colourful scenes are at their best with the fun and humour shown in the puppet show scene and the scenes at the ball. 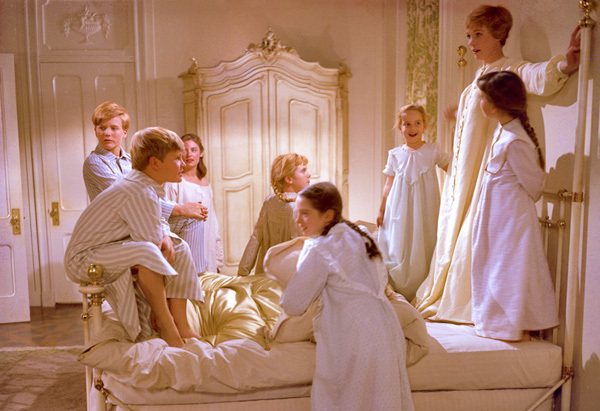 Maria’s influence in the house is best summed up by Captain Von Trapp who – on hearing his children sing for the first time to the Baroness – says to Maria “You brought music back into the house””. Which she did. Along with colour, laughter and love. 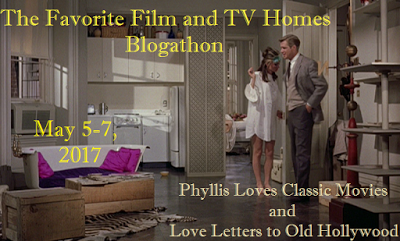 This review was entered in The Favourite Film and TV Homes Blogathon run by Phyllis Loves Classic Movies and Love Letters to Old Hollywood. More reviews with this cast include my original The Sound of Music review and a Remembrance post on Charmian Carr. Julie Andrews also is reviewed in The Princess Diaries. Nicholas Hammond stars in my review of Dynasty The Making of a Guilty Pleasure. Christopher Plummer stars in my reviews of Star Trek VI – The Undiscovered Country and International Velvet. This is a fine article! 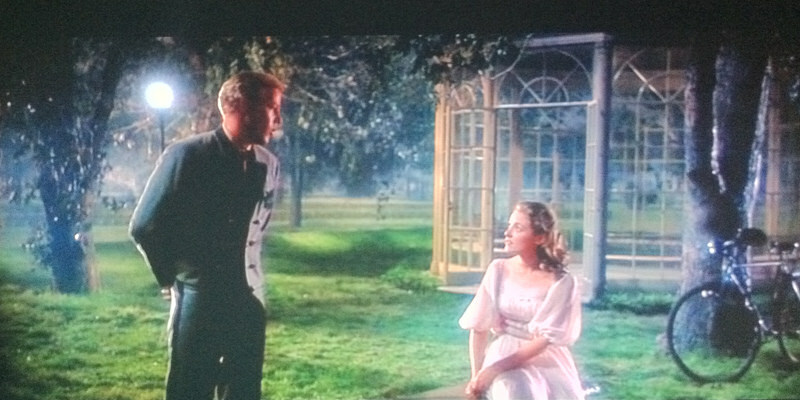 “The Sound of Music” has been one of my family’s favorite films for a long time. I, Rebekah Brannan, have not participated much in the blog world in the past, but I intend to become more involved now. I have read some of your other articles, and they are all informative and enjoyable. Thanks for your invite, will look into it and get back to you. Thank you for responding. I hope you’ll be able to join us! The Von Trapp mansion is, indeed, gorgeous. I love all rooms, especially the entrance and the gazebo – I’d love to read there in a warm Summer day. I didn’t realize how much I love this house until I started reading your post. It’s quite amazing, isn’t it? I adore those scenes by the lake — they’re so gorgeous. And who can forget the romantic beauty of the gazebo? I was actually getting goosebumps just reading about that moment when the Captain first joins his children in singing. It makes me cry every time. Such a heartwarming film. Thanks for the lovely feedback – that’s the bit I cry at too, Christopher Plummer is fantastic, cried at his performances more than a few times – especially this Somewhere in Time and International Velvet. What a great point about the colors and lighting of the house changing along with the story line! It’s great to revisit a film you’ve seen dozens of times and look at it a certain way. I’m going to see it differently now too. Great post! It is a lovely house, understand about the ?? ! What a shack! The von Trapps home in Austria was beautiful. Such a great example of architecture and history. I can’t imagine how great it would be to have such space. Thank goodness for movies that can transport us to such glamour.